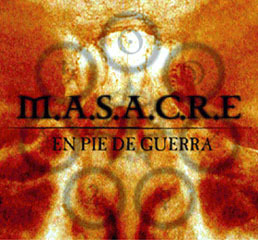 The Tuesta brothers (Martin on guitar and Miguel on bass) created M.A.S.A.C.R.E. in 1985 in Lima - Peru, along with Coqui Tramontana on the other guitar. Initially, they invited some of their friends to complete the band, but soon after recruited Pierpaolo de Bernardi(drums) and Miguel Angel Cervantes (lead vocal). That's how it all began for one of the most known and well-represented metal bands in all of South America. During the next two years in 1986 and 1987, M.A.S.A.C.R.E. consolidated themselves as the most important metal band in Peru. It's during that time, that they entered the studio to record what became their first album titled "Sin Piedad" ("Without Mercy"), which was originally intended to be distributed through CBS - Peru in 1988. Due to the economic crisis in the country, CBS was forced to close their offices in Lima, and their album was forced to wait a long time for it to be finally released. Meanwhile, the band continued playing in all the metal concerts of the time and their fans multiplied. But unfortunately, due to personal reasons, most of the band decided to leave Peru and live abroad although the band had reached some level of success. Thus, M.A.S.A.C.R.E. dissolved for a few years. At the beginning of 1998, the Tuesta brothers came back to Peru, after spending several years living in Venezuela. Needless to say, they decided to start where they left off, and M.A.S.A.C.R.E. was back. For this new era in the band's history, they bring two good friends from the metal scene in Lima, Willy Hermoza on drums and Rafo Mackee on guitars, keeping Miguel Angel Cervantes on vocals. Their official come back was seen at the "Acero II" festival, proving to the crowd that their great level was still present regardless of the length of time they were away. And because of this, they were selected to open for Quiet Riot when the American band visited Peru on tour. Their great performance led them once again to be considered by the public and the critics as the most important metal band in Peru, sharing the stage later on that year with Criminal from Chile. At the end of 1998, M.A.S.A.C.R.E. 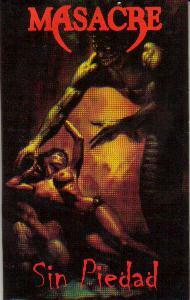 finally publishes their album "Sin Piedad", originally recorded in 1988. Almost simultaneously, they released "En Vivo Hasta El Final", a CD which included almost all of their older songs captured from live performance. It was at this point that for personal reasons, Miguel Angel Cervantes left the band in 1999. 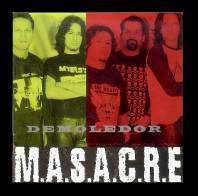 Omar Pizarro, a young singer who was just coming in to the metal scene, took over the vocal responsibilities, and with him M.A.S.A.C.R.E. began working on the new songs for their next album titled "Demoledor". 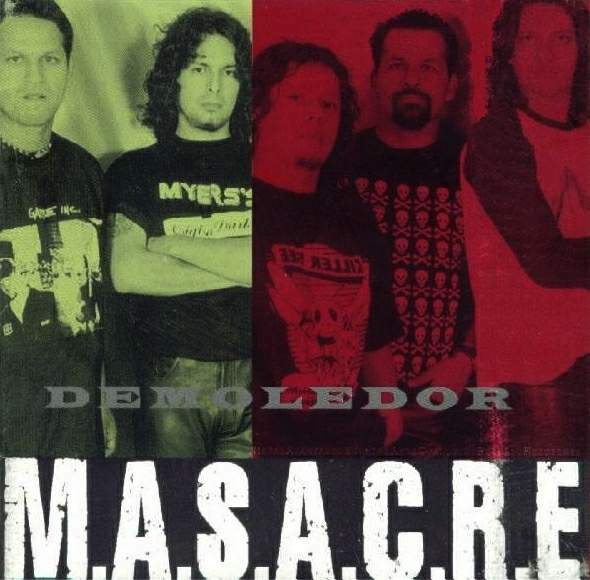 "Demoledor" hit the stores on July of 2001, sending M.A.S.A.C.R.E. on tour throughout most of the country. The exposure they received with the album, once again established a name for themselves in the metal community of South America. They were invited to track a song for the "Tributo a V8", a tribute album to the mythical band V8 from Argentina, sharing credits with important bands such as the legendary Baron Rojo from Spain. Also, they continued to share the stage with bands already established in the entire continent such as Rata Blanca of Argentina, and Transmetal from Mexico. Even though it had been a great return for M.A.S.A.C.R.E. that year, Martin Tuesta made the decision to move to the United States of America, but not before searching for the ideal replacement for him in the band. His list was reduced to one name: Coqui Tramontana, cofounder of M.A.S.A.C.R.E.. Throughout the distance, Martin remains a key player in the future of the band, becoming part of the management team for the band since 2001. In 2003, after a very busy period for the band, Rafo Mackee decides to leave the band, and is replaced by Jaqo Sangalli. During the second half of the year, M.A.S.A.C.R.E. initiated the writing process of new material for their latest upcoming album. The band contacted German Villacorta (producer and engineer who had already worked with bands such as Ozzy Osbourne, L/P, Alice Cooper and Lynch Mob to say a few), to produce their new album. In November, they signed to Lima 32 Avenger Productions and started the recording process in Lima. At the beginning of 2004, M.A.S.A.C.R.E. began their new era, completing the tracks for the new album, which was recorded both in English and Spanish. Around this time, Willy Hermoza made the decision to depart from the band due to very important personal reasons. However, thanks to destiny, Willy left his mark for all the fans to hear by completing all the drum tracks for the new album. Auditions were called, and Hans Menacho, was introduced as their new drummer and with him, the band began their new tour schedule in May. Meanwhile, the mix for the new album moved to Hollywood, California and M.A.S.A.C.R.E. invaded Henson Recording Studios (formerly known as A&M Studios), where German Villacorta finished the mix for the new album in July. "En Pie De Guerra" was released in August 2004 and "On The Warpath" in 2006 under Lima 32 Avenger. It is in 2005 when Omar Pizarro decides to emigrate to Spain along with his family. After a couples of months searching for the right singer, Adrian Del Aguila has been the chosen one and the band is back writing new material and planning a European tour for 2007. 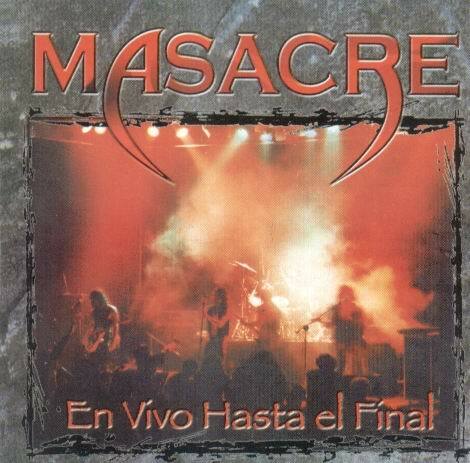 The next page on the band's history is still to be written, but through sweat and blood, M.A.S.A.C.R.E. promises to continue, as always, to be... ...On The War Path...Until The End!